The Coca-Cola Foundation awarded more than 27 Sustainability Initiatives grant in the U.S. in 2012 and is already preparing for a “Greener” 2013. Emerson’s Ovation expert control system provides flexible and accurate control of a powerful biomass gasification plant in France. 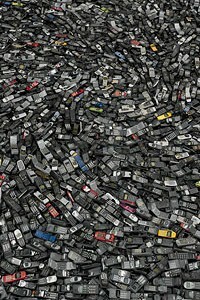 The EPA estimates that there are 141 million mobile devices at end-of-life, but only 11.7 of those will be recycled. BASF will sponsor the second season of Sustainable Saturdays at Safeco Field with the Seattle Mariners. All-Star pitcher Felix Hernandez will challenge fans to ‘Strike Out the Landfill’. Fat and oil used for cooking are often poured into sinks and cause buildup in drains and ultimately end up in sewer systems. This waste, called fatbergs in England, will be reused as energy at a fat-fueled power station in east London. Cascades Moka facial tissue marks an extension to company’s growing line of sustainable, single-use paper products that eliminates chemical whitening and reduces 25 percent of its environmental impact. In an effort to help launch their new sustainability program, the Kansas City Chiefs partnered with the EPA to hold a community-wide recycling drive at Arrowhead Stadium on April 20. In a new European project, researchers are investigating how tires can be recycled and turned into synthetic fuels and other useful materials. The latest report from the Water Research Foundation (WaterRF) measures energy use and greenhouse gas emissions produced by water utilities. By combining the Australia-based Outback Ecology with MWH Global, the companies will be able to provide more opportunities to serve mining industry clients across the full lifecycle of energy and natural resources engineering projects. March 18-24 is annual Fix a Leak Week, and the EPA is encouraging Americans to replace leaky plumbing fixtures and sprinkler systems as a way to help households save more than 10,000 gallons of wasted water per year. According to the EPA, one in 10 homes has some sort of water leak that results in 90 wasted gallons of water each day. Researchers at the UPNA (Public University of Navarre) are leading the ENEIDA project, which is trying to tackle the technological changes needed to create more energy-efficient and more environmentally-friendly electronic devices. While many companies tout their efforts to operate more sustainably, or lessen their environmental impact, few can measure how they are helping other businesses do the same. Salesforce.com is ready to do both, as documented in its first sustainability report.